Carl Elliott asks for your help with getting crucial information on the suicide of Dan Markingson made public. In early December, a petition signed by nearly 3,500 people was delivered to Minnesota Governor Mark Dayton, calling for an investigation of the death of Dan Markingson in a University of Minnesota psychiatric research study. That same week, the Faculty Senate at the university overwhelmingly approved a resolution calling for an investigation of Markingson’s death. Yet four months later, we still have seen no results. The president of the university, Eric Kaler, has indicated publicly that any review he commissions will not include an investigation of Dan Markingson’s death. Governor Dayton has not even acknowledged our petition. In May of this year, we will reach the 10-year anniversary of Markingson’s suicide. We will also reach the five-year anniversary of the first public reports of the disturbing circumstances surrounding Markingson’s death: the coercion, the corruption, and perhaps worst of all, the appalling clinical care. The Markingson case has attracted international attention in publications such as the British Medical Journal, The Medical Journal of Australia, Nature, and the Journal of Bioethical Inquiry, not to mention this blog (see here and here.) Yet on the University of Minnesota campus, most students and faculty members know little if anything about the case. Over the past six months evidence has accumulated that Dan Markingson was not the only patient who died or was seriously injured in psychiatric research studies at the university. Two investigative news reports have appeared with evidence of misconduct involving other patients (see here and here.) A confidential letter has emerged indicating that the Institutional Review Board was aware of ethical problems with psychiatric research at the University in 2009, and that it was concerned enough to request an external investigation. And for over six months, the university has stonewalled our open records requests for reports of deaths and serious injuries in psychiatric research studies. Please make your voice heard. And let us know that you called by leaving a comment at http://www.danmarkingson.com. My name is ___ and I am calling to leave a message for Board of Regents Regent Chair Richard Beeson. I am alarmed by the ongoing news about research abuses against mentally ill patients in the University of Minnesota’s Department of Psychiatry. I am especially disturbed by the misleading and deceptive statements issued by University of Minnesota officials, including the claims that these research abuses have already been investigated. I am calling to ask the Board of Regents to take action to answer two questions. My name is ___ and I am calling to leave a message for Gov. Mark Dayton. I am alarmed by the ongoing news about research abuses against mentally ill patients in the University of Minnesota’s Department of Psychiatry. I am especially disturbed by the refusal of President Eric Kaler to investigate the suicide of Dan Markingson, despite a Faculty Senate resolution calling for an investigation. I believe it is the responsibility of Governor Dayton to ensure the protection of vulnerable, mentally ill patients at a state university. 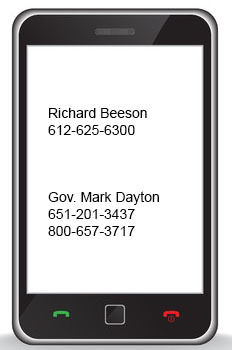 I am asking Governor Dayton to respond to the petition calling for an investigation of the death of Dan Markingson that was delivered to him four months ago. In addition, Governor Dayton should demand that the University of Minnesota make publicly available the number research subjects that have died or been seriously injured in psychiatric research studies since the current Chair of Psychiatry, Dr. Charles Schulz, was appointed in 1999. Watch Carl Elliott’s presentation on the Dan Markingson case at the Health Law Institute, Dalhousie University, Halifax Canada on February 28, 2014.